How about a meat box with spring roll wrappers? 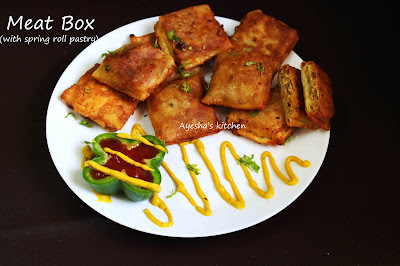 Its very simple and easy to make various spicy and sweet snacks with spring roll pastry. So lets try a spicy yummy lovely treat for today's snack. Its a lovely meat box recipe with spring roll wrappers. 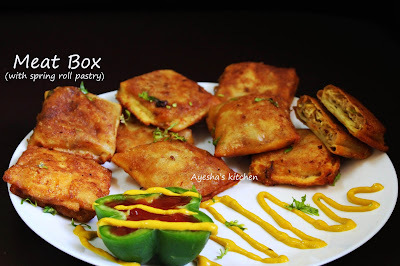 Meat box is a very popular Malabar snack during Ramadan for Ifthar. Traditionally, meat balls / irachi petti is prepared with home made dough made of all purpose flour or wheat flour. But it is time consuming and so is very difficult to prepare it for any parties mainly for Ifthar parties (Ramadan). But making of meat box recipe is very easy, quick, soft and yummy with the spring roll pastry. Spring roll recipe is very common and popular appetizer which is originated in China. Spring rolls with different shapes, sizes and fillings have been a popular snack in Asia for centuries. In China spring rolls are savory snack filled with cabbage and other veggies. In Hong kong these are fried dish filled with minced pork and veggies. Like so, In Australia, Europe, Netherlands, Central nd South America, Chile, Mexico, Argentina, Brazil ...spring rolls are called by different names and with entirely different fillings. Any ways we should remind one thing that Chinese cuisine enjoys the distinction of being the most popular in the world. 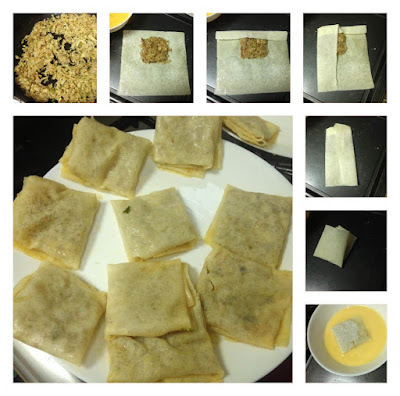 For this recipe, you can use store bought spring roll wrappers / pastry or home made spring roll sheets. Here, for the filling i used onion and minced chicken (cooked) sauteed with soy sauce,chili sauce, pepper powder and salt. Thus prepared filling is covered or wrapped in spring roll pastry like a meat box and dipped in egg batter and finally deep fried or shallow fried. Its soft, spicy, tasty. Do try and do not forget to share your valuable feedback about this recipe. Enjoy cooking...So here is the recipe showing how to make meat box / irachi petti . Keep the spring roll pastry outside the freezer for defrosting. 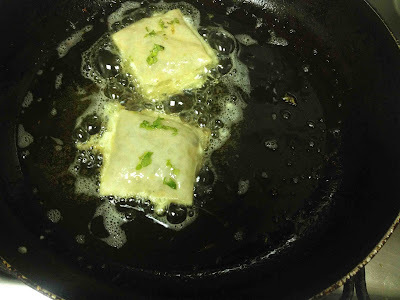 Heat oil in a pan and saute onion until transparent. To this, add chopped bell pepper or chilly sauce (for more hotness, you can add chilly sauce). Saute well and then add minced chicken. Saute chicken very well in a medium flame until it became non sticky. Then add soy sauce, pepper powder and salt. Mix well . (You can add veggies or spices also. Its up to your taste and preference. ) Set aside. Whisk an egg in a bowl with salt and pepper. Set aside. 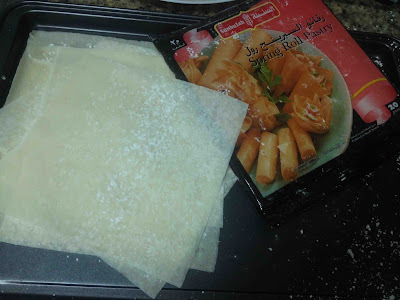 Now take a spring roll pastry, add 1 tbsp of the filling (as shown in the pic..please see photo for instructions. ) and fold it like a box. Dip in egg batter (this is for gluing the edges) and then deep fry in hot oil. Garnish with chopped coriander leaves and serve hot with tomato ketchup.